Palmar hyperhidrosis (PH) is the symptom of excessive hand sweating caused by the erethism of the sympathetic nerve dominating the palmar sudoriferous. Compared to conventional thoracotomy, endoscopic thoracic sympathectomy has been recognized as the most effective way to treat this disease, as it achieves much improvement in minimizing the invasiveness. However, patients may partly suffer from chronic postoperative incisional pain, which is probably related to the stimulation of the intercostal nerve during the operation. 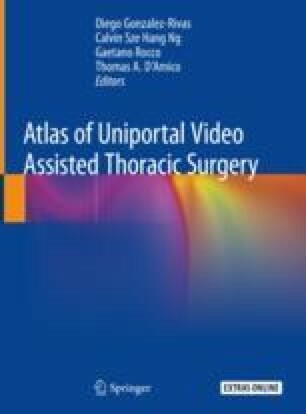 To improve the situation, we introduced the concept of Natural Orifice Translumianl Endoscopic Surgery (NOTES), and carried out the experimental study of transumbilical thoracic sympathectomy. Furthermore, this surgical technique was applied to clinical treatment in April 2010 based on the great success of animal experiment. This surgical technique, which is mainly discussed in this chapter, has been proven to have advantages in reducing pain and improving cosmetic results after its application in nearly 200 clinical cases. The trial was approved by institutional review board of Fuzhou General Hospital, and informed consent was obtained from all participants and/or parents/LAR.